Successfully Added Scishion V88 Mars 2 TV Box - 4K Support, Quad-Core CPU, 2GB RAM, Kodi 16.1, Google Play, WiFi, Miracast, DLNA to your Shopping Cart. Bring hours worth of fun and entertainment into your living room with the Scishion V88 Mars 2 Android TV box. This Android media player lets you enjoy all the basic Android features straight from your big screen TV. Simply plug it in, and you’ll be all set to play games, watch movies, and take advantage of the latest TV Apps. With 8GB memory and a 32GB SD card slot, this Android TV box holds plenty of storage for all your files. It runs on an Android 6.0 operating system which means that a smooth and lag-free user experience is guaranteed. If you’re looking for a cheap way to take the most out of your television, this Android TV box is perfect for you. With access to the Play Store and Kodi 16.1, this Android TV box provides you with easy access to millions of free media files. WiFi support allows you to download Apps straight onto your TV box and additionally lets you browse the internet from your television. From now on, you’ll be able to stream movies on YouTube, read the news, and use social media while using your TV. To further increase your user experience, the Android Media Player supports Miracast and DLNJA for easy file sharing. Inside its compact body, this Android TV box holds a sophisticated Quad-Core processor. This CPU has been clocked at 1.5GHz and brings along a powerful performance. Along with 2GB of RAM, this Android TV box lets you tackle virtually anything you throw at it. Basic games, films, and Apps – nothing is too much for the Scishion V88 Mars 2. With its 4K support, this 4K TV box truly treats you to stunning visuals in high-detail and vivid color. From now on, you’ll always be able to enjoy a cinematic experience without ever needing to leave the comfort of your living room. 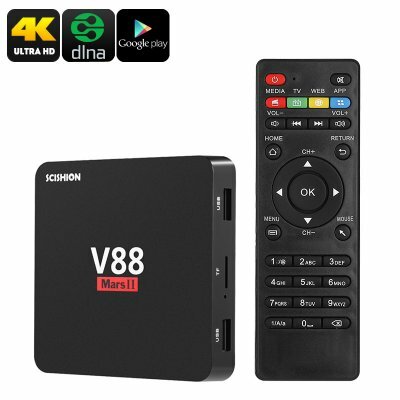 The Scishion V88 Mars 2 Android TV Box comes with a 12 months warranty, brought to you by the leader in electronic devices as well as wholesale electronic gadgets..